For me, Brandon Sanderson is one of those authors who gets to jump the line. When a new book comes out I read it, immediately. I’ve been firmly located in the overly-obsessive fangirl camp since 2008, so I’ve been enjoying the works of one of fantasy’s most prolific authors for the better part of a decade at this point, and I have to say that I’m continually impressed by his work. 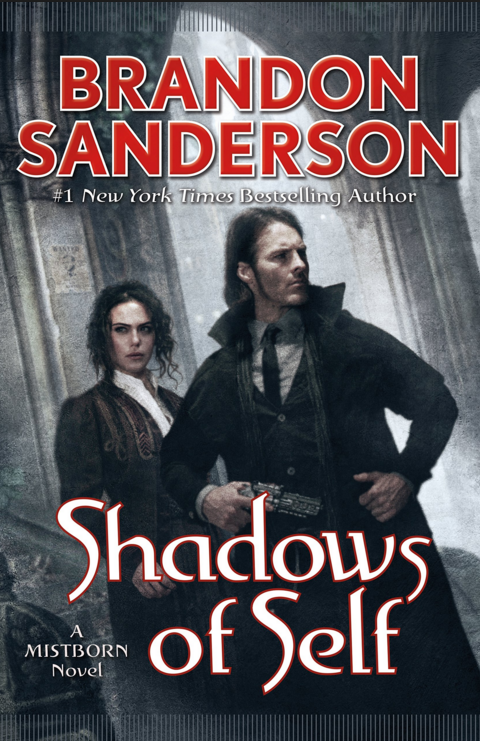 His latest installment in the Mistborn universe, Shadows of Self, is no exception. Shadows of Self is the sequel to The Alloy of Law, and continues the story of Waxillium Ladrian and his sidekick Wayne. Wax comes from a wealthy family, but spent quite a few years as a vigilante lawman in The Roughs. He has returned to the city life of Elendel, but he is having a hard time fitting into a world with politics, police, and ever-changing technology. As with the first novel about Wax and Wayne, you get a fun detective story mixed in with some awesome magic and cool fight scenes. However, this novel also has much more development of the changes to politics, religion, and technology since the original Mistborn trilogy. We get to find out what happened to a lot of the cool creatures that were major plot points in the original books as well. This novel also has a fair bit of character development as well, and shows a much more introspective side to a group of characters that could have come across as excessively comedic in the first novel. Shadows of Self doesn’t have quite as much action as The Alloy of Law, but I actually appreciate the change of pace, especially because it allows for more world building. Anyone who has read the original Mistborn series is going to love how the events of those novels have influences the religion and politics of the newer stories in such a logical way. There are also quite a few Cosmere nuggets sprinkled into this text, so all of the obsessive Sanderson fans should be quite pleased with that as well. I don’t think knowledge of the Cosmere, or even reading the other Mistborn novels, is necessary to enjoy the story, but I do think being able to geek out over the key sentences scattered throughout the book did substantially increase my enjoyment of it. Aside from the Cosmere geekery, I also have to applaud the ending of this book. Sanderson always delivers a great ending, but I believe the only appropriate way to describe this one is that it gives you “all the feels.” I’m trying to avoid spoilers as much as possible, but I will say that if you think the middle of the book gets slightly too focused on the politics and plotting, don’t worry – there will be too much emotion to handle by the end. And if you are worried that you won’t be able to deal with the emotional ending, don’t worry – the third installment of Wax and Wayne trilogy, The Bands of Mourning, will hit stores January 26, 2016. I don’t know if this is the fastest publication sequence for two novels in a series like this, but fantasy fans are used to waiting at least a year (or two, or three, or six…) between books, so this quick release sequence is actually really exciting. Although this book had a satisfying ending, I’m really excited for the conclusion to the Wax and Wayne trilogy, so I’m very excited for the end of January. Overall I think this was a great addition to Sanderson’s Mistborn series. I think it could be enjoyed by anyone, even without having read the other books in the series, however, this story is one that I think readers will enjoy more if they have at least read The Alloy of Law or the original Mistborn trilogy. It was a great read, with nerd-tastic world building details and enough emotional punches to last me the winter. Highly recommended.